• Justin Bogle returns to action on the Suzuki RM-Z450 and scores two holeshots. • Jimmy Decotis runs podium speed on the Suzuki RM-Z250 in only his second race back. The Autotrader/ Yoshimura/ Suzuki Factory Racing Team made their annual stop to the only sand circuit on the 2018 Lucas Oil Pro Motocross Championship and fielding three riders on the all-new Suzuki RM-Z450, the team came into Massachusetts for the weekend’s Southwick National with a head of steam. Justin Bogle returned from injury and made an immediate impact in the 450 class, scoring both holeshots and running with the front-runners. Team-mate Weston Peick overcame a first-turn crash in the second moto to earn a top-10 finish and has now finished inside the top-10 at every National in 2018. Justin Hill looked primed and ready to make a statement in only his third 450 National. Unfortunately, Hill was collected in a first-turn crash in the first moto. Nevertheless, he gritted-it-out and completed the moto, despite a deep cut in his arm. In the 250 class, hometown hero Jimmy Decotis nearly pulled the holeshot in the opening moto on his RM-Z250 and worked to match the pace of the front-runners in his second race back from injury. Peick continues to impress on the all-new Suzuki RM-Z450. The Menifee, California resident has the heart of a warrior, evidenced by his charge through the pack in the second moto. Collected in a massive first-turn pile-up, Peick put his head down and rocketed past nearly three-quarters of the field. His efforts netted a 10th place finish – his sixth top-10 in the series and he holds sixth in the point standings. The Autotrader/ Yoshimura/ Suzuki Factory Racing Team expected Bogle to make his return at this weekend’s RedBud National. It was a pleasant surprise when the National-winning Bogle came back earlier than previously thought to race at Southwick. The Cushing, Oklahoma native used lightning-fast reflexes and the speedy Suzuki RM-Z450 to nail both holeshots. However, mistakes and ‘ring rust’ slowed his charge. Bogle’s 18-20 moto scores netted him 23rd overall, and he vows to only improve from here. Hill spent this past week preparing for Southwick by riding at several sand tracks in the North Carolina area. 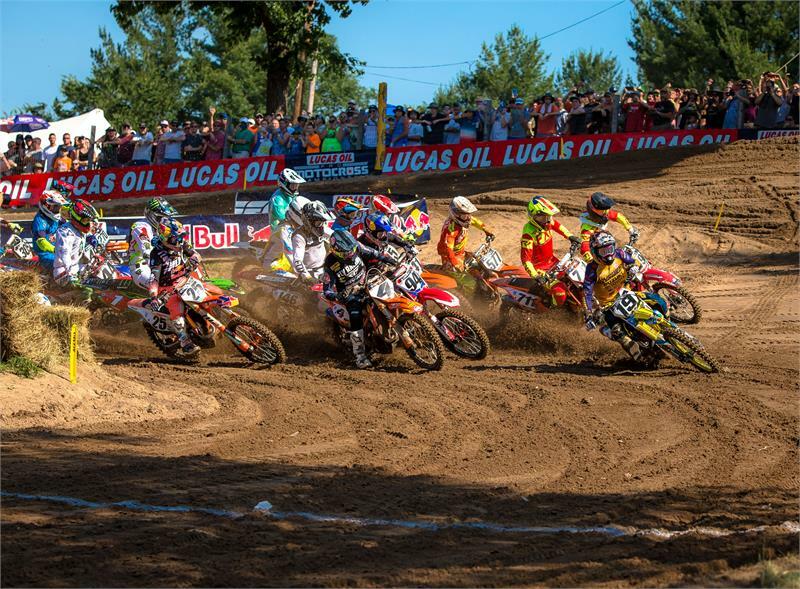 Unfortunately, there was no way that the 450 stand-out could prepare for the melee that occurred in the first turn of the opening moto at Southwick. Hill suffered a deep cut in his right arm, but still managed to finish the race. After receiving medical attention following the moto, it was determined that Hill should be evaluated at a local hospital. We will provide an update on his condition when it becomes available. Decotis had the Southwick National circled on his calendar months ago. The Massachusetts native was determined to race his hometown National. The RM-Z250 rider achieved his goal and did more than that by running in second place during the opening moto. Fans hung over the fences yelling Decotis’ nickname, “The Rippa,” while Jimmy styled at the front for several laps. A series of crashes slowed his progress, but that’s to be expected for his second race back from a serious spinal injury. Decotis was caught up in a first-turn crash in the second moto and the impact caused a mechanical issue that could not be overcome and he had to retire from the race. “Southwick was a tough race. The heat index was very high, and the track itself made the conditions extremely challenging. I continue to be impressed by Weston Peick. He had a big crash during press day, but he dug deep and came away with another top 10. It was nice to see Bogle racing. His starts were dialled, but he’s not used to that pace. The intensity will come. As for Hill, he suffered from a case of bad luck. The speed was there, but that’s how these things go. The Autotrader/ Yoshimura/ Suzuki Factory Racing Team will travel to Buchanan, Michigan for round seven of the 2018 Lucas Oil Pro Motocross Championship, held at the famed RedBud circuit on July 7th.